Nearly all libertarians are political, but very few are in office and that’s where a lot of our problems start. Now I’m not going to get into the whole philosophical debate about whether a state is permissible or moral, the fact is, one exists and it has power that all libertarians oppose to some degree, this piece will explain ways that libertarians can try to remove some of this power. Many libertarians oppose operating within the current system, as it’s taking part in what they see as an immoral system, Now unless you have enough money to go out and start your own country in the middle of the desert or ocean away from the tax man, this is stupid and will do you no favours. In the western world if you want to be taken seriously, you have to play the politics game. It would be a very sad thing if liberty were allowed to stagnate and turn into a cesspool of conspiracy theorists and survivalist nutjobs. It is imperative that libertarians, both prominent old ones and newcomers just discovering how terrible the government is, are vocal in their ideas and actively try to change the system for the better. Of course it’s hard to come to terms with the fact that at least for the foreseeable future, we’re going to have to choose between the lesser of two evils, it doesn’t mean you can’t try to change things from within. Look at what Ron Paul is doing over in the US at the moment. He may not be winning but he’s got every other republican candidate talking about auditing the fed, real cuts to spending and maybe even questioning the sacred cow of military spending. Gary Johnson (arguably the more libertarian of the two) on the other hand is a possible election spoiler with his attempt to run for the Libertarian Party nomination splitting the libertarian vote and perhaps putting Obama back in for another 4 years. Thankfully in Australia, where we have preferential voting, we don’t have that problem, we can all vote for greater liberty whilst hedging our bets by preferencing the less tyrannical of the two major parties, whichever one happens to be that particular election. Thanks to the work of John Humphreys et al. we have the Liberal Democratic Party, the forefront of libertarian politics in Australia, but unless something unforeseen happens in the near future, it’s going to be a fringe party with no chance of getting a seat in any house at any level of government. The best thing we libertarians can do is start to join major parties and change them from the inside, speak at their forums, expose politicians to the ideas that maybe other people aren’t just sources of revenue for the state, or to quote a rapping Hayek “…chessmen that you move on board at your whim–their dreams and desires ignored.” The more libertarian activity out there, the more people will hear it, if they hear it enough, maybe they’ll start listening and finally we’ll start to see actual change for the better. In Australia we have quite a small libertarian community already, there’s no point fracturing it further by refusing to vote for the more libertarian party because some of their policies aren’t libertarian enough. My message to all lovers of liberty is: Get in and participate, become a member of a political party, influence their policies. If you can’t stand either of the major parties, join the LDP, help them get registered at a state and local level, The lower the level of government they’re registered at, the more say you’ll have on policy and the more likely they are to get a foothold. And remember if you don’t participate, there’s no way it’s going to change. It’s an uphill battle, but unless we do something now, things will get worse, it’s not going to be our fault, but it’s always terrible to look back and think that you had a chance to stop something but didn’t. Johnson campaign faltering; GOP deserves censure. Media bias and bastardry and Republican cowardice deny the US a great candidate. 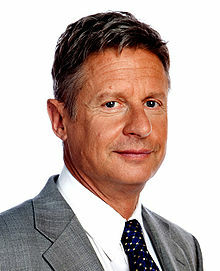 Any avid reader of the Ruidoso News is by now aware that the former two term New Mexico Governor, Gary Johnson is standing for the Republican Presidential nomination. Unfortunately, apart from a couple of passing references in the Adderville Examiner and a fairly positive Op-Ed in the Galts Gulch Gazette there has been little media coverage of his candidacy. The media has in the main staged a lockout. While it is unreasonable to expect candidacy to automatically entitle anyone to inclusion in media coverage and a place in the debates, a candidate who meets the requirements should not be excluded. This is what has been done to Johnson. In May CNN blocked him from a debate in New Hampshire, although he qualified as an announced candidate with 2 percent support in three national polls during the month.